Navigating at night just got a whole lot easier with the affordable 4x E-Zoom FLIR MD-625. With a Flir Camera you can steer clear of obstacles, avoid collisions and even see people in the water at night – all with the help of this compact Thermal Imager. 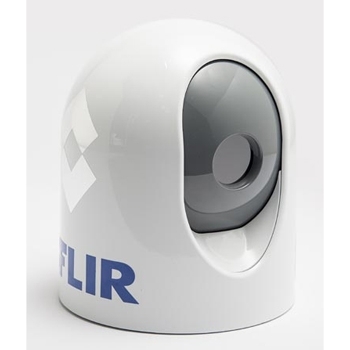 FLIR MD's has manual panning adjustment of up to 30’ + or minus and tilt of +34’ and -27’. This allows for wider side views and also up and down control of your front view. Perfect for smaller cruising, fishing or sailing vessels the M625 is small in size and weight at only 3lbs and 7” in height and 6” in diameter it can be mounted virtually anywhere - T-top, cabin roof, radar arch or mast. However, don’t let the small size fool you. Offering crisp clear thermal images with its 640x480 pixel this FLIR imager can easily detect things that the naked eye would otherwise miss in the dark. Navigate confidently knowing that the MD625 can pick up images of a man in the water up to 2,700 feet (.44 Nautical miles or a small vessel up to 1.2 Nautical miles plus with the 4x e-zoom you can magnify these images for enhanced viewing. Stay safe, Stay Alert while on the water at night – Get your FLIR MD-625 today. Each FLIR MD 625 comes with: MD 625 Camera, O-ring for base, 7.7 meter (25-foot) double-shielded low smoke zero halogen Ethernet cable, 7.7 meter (25-foot) coaxial cable for video output, FLIR PoE injector, RJ45 weatherproof coupler with various other video adapters, Female-to-female F-type video connectors, Mounting hardware kit that includes six M6 x 60 stainless steel-threaded studs with washers, nylock nuts, and acorn nuts, for attaching the MD-Series camera body, Zip ties for use during installation Camera Unit, MD-Series documentation package and a Two Year Warranty.